Hello. I have been spending some time lately checking out the wealth of resources for teachers available online through the Smithsonian. As a history teacher, I always like to see what is happening at the Museum of American History. It has just reopened after a 2 year face lift and I can't wait to see it the next time I'm in Washington DC. The museum has a well organized collection of lesson plans and resources available to teachers but a couple of days ago what really caught my attention was their use of web 2.0 to connect to visitors. The Museum of American History has a great blog named "O Say Can You See", a Flickr account for behind the scenes pictures, a You Tube channel with a variety of clips, a Facebook page and you can follow them on Twitter. Amazing. The Smithsonian gets it and I've heard the new Smithsonian leadership has a true vision for utilizing web 2.0 as a tool. 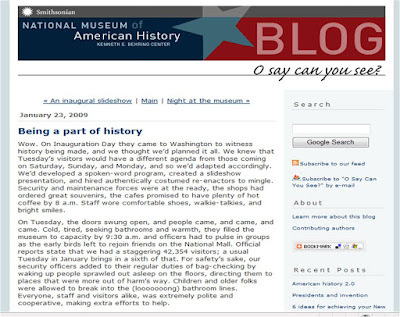 The Smithsonian recently held a conference to explore the potential of web 2.0. I am very impressed. If you are a history teacher you really should add the O Say Can You See blog to your reader and start following them on Twitter. I can't wait to see what they do next. Great info - another part of the Smithsonian, Smithsonian Folkways, has many music educational resources including some with historically significant recordings. David - Thanks for adding this link. I will check it out. Students love using music in history class.